I had every intention of posting about the beach tonight, but I have felt terrible all day so I'm going to bed early (that's right, 8:30 wahoo!!!) and hoping that whatever is wrong is gone by tomorrow. I don't think it's any kind of illness, and anyway I don't have time to be sick, so there's that. 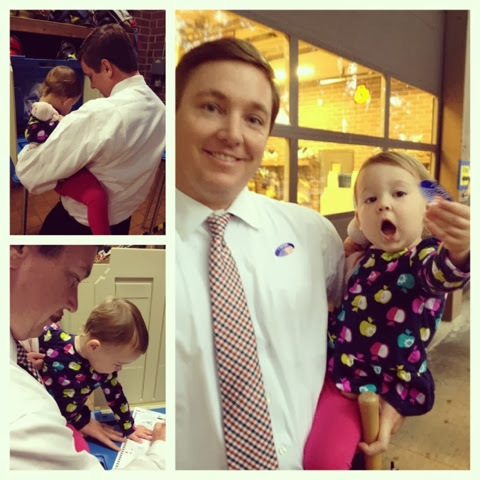 Just wanted to post a quick pic of my sweet girl and my sweet hubby at the polls yesterday! Apparently you aren't supposed to take pictures inside the polls, whoopsie. Lilly's second time voting was a success, I'd say. More tomorrow, hopefully. Happy hump day!